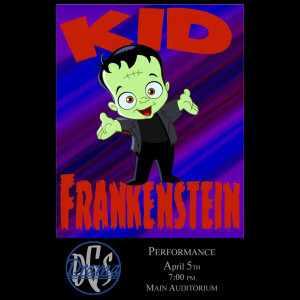 South High Drama presents their Childrens Play Kid Frankenstein on Friday, April 5 at 7 p.m in the Auditorium. Synopsis: In the frightfully funny re-imagining of Mary Shelley’s classic, Frankenstein, Frankie and Irving are science enthusiasts who have an unusual idea for the upcoming Science Fair! When Doctor Frankenstein’s ancient secret book arrives from Transylvania, the friends are whisked away into a sci-fi fantasy of time-warped, weirdly scary and lively adventure. Kid Frankenstein is never too scary for the little ones and is appropriate for all ages!